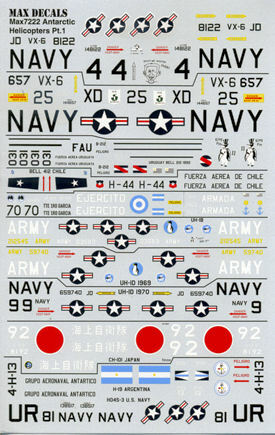 Max Decals doesn't produce sheets with the frequency that we see from some others, but every release is well worth the wait. Their decals are generally full of fascinating subjects, and this most recent one is no exception. There are 13 different options on this one and I'm sure that any aircraft modeler will find something that will piqué his interest, especially if one is into da-glo or international orange. First subjects are a pair of Chickasaw helos. The overall orange version is an HO4S-3 from the icebreaker USS Glacier in 1952. The second subject is a white and bright red Argentine version from 1968. Both are the straight boom version and for this, you'll want the Revell/Italeri kit. I'll cover the UH-1s next as there are a few of them. First is a UH-1B with the US Army during Operation Deep Freeze in 1965. It is glossy olive drab with dayglo orange on the nose and boom. An overall dayglo orange version from 1962 can also be modeled. A UH-1D, also with the Army in gloss olive drab and dayglo orange panels is from the 1969 season. Finally a lone US Navy UH-1D with VXE 6 during 1970. This is overall International orange. Kits are once more from Revell/Italeri. Staying with Bell, there is a Bell 212 as operated by the Uruguayan Navy during the 1990s. It appears they took a standard white over grey aircraft and painted large areas on the nose and tail with bright red. Revell/Italeri again for the kit. The Bell 412 was operated by Chile during 2009. This is a light grey with only the doors in orange. Upper rotor on this is broad red/white bands. Kits by, you guessed it, Revell/Italeri. Moving to some heavier helos, there is an AS.332B as operated by the Argentine Army during the 1990s. This aircraft is olive drab with orange on the sponsons and the upper portion of the aircraft. For this, you can choose from Heller or Italeri, just be sure to use the kit with the large sponsons and short fuselage. 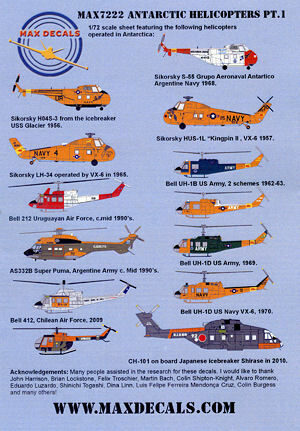 The most modern helo on the sheet is the Merlin as operated by the Japanese. This was based on the icebreaker Shirase during 2010 and is painted dark grey with the dayglo orange bits. Italeri are the only ones who do this kit and you will have to do a few mods to properly replicate this aircraft. Finally, a Bo.105 as operated by the Uruguayan Navy during 2010. This is an ex-German Army helo and so is in a base color of olive drab and black, but with orange doors and upper fuselage. This will probably be the most difficult kit to find as the Airfix Bo.105 has been out of production for a while. The decals themselves are superbly printed and in perfect register.